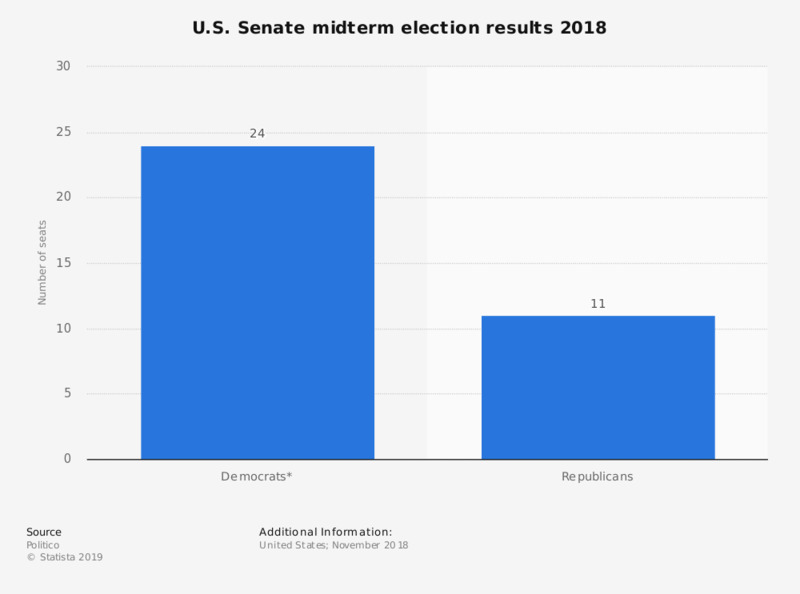 This statistic shows the results for the United States Senate in the 2018 midterm election. During that election cycle, 24 seats were won by the Democrats, and 11 seats were won by the Republicans. There are 100 voting members of the United States Senate, with two senators per state, regardless of population. 51 seats are needed for control of the Senate. Members of the Senate have six year terms, with staggered elections. In the 2018 midterm elections, 35 Senate seats were up for election. 23 Democratic seats and 42 Republican seats were not up for election in that year. In the 2018 midterm elections, Republicans maintained control of the Senate for the upcoming 116th United States Congress, which will convene on January 3, 2019. *Totals for the Democrats include two Independent seat wins; Sen. Bernard Sanders of Vermont and Sen. Angus King of Maine. Both Sen. Sanders and Sen. King are Independents who caucus with the Democrats.